Faculty member Emma Mercier will teach several of the new courses within the College of Education’s new Digital Environments for Learning, Teaching and Agency program, which focuses on the creation and research of digital environments, such as technology-enhanced classrooms, mobile devices and immersive simulations. CHAMPAIGN, Ill. — New degree programs in the College of Education will focus on the research and design of digital learning and teaching technologies and their applications across a range of disciplines. The new offerings, all within the department of curriculum and instruction, include master’s degree and doctoral programs, and the addition of a fourth optional concentration for undergraduate students in the learning and education studies major. The college also will offer a certificate of advanced study for practicing teachers and other professionals interested in new learning and instructional technologies. The new courses and degrees are being offered by the Digital Environments for Learning, Teaching and Agency program. A new program within the department, DELTA is focused on the creation and research of digital environments, such as technology-enhanced classrooms, mobile devices and immersive simulations. The technology-focused curricula and the Bachelor of Science in Learning and Education Studies degree are expected to draw students from a variety of disciplines across campus, said curriculum and instruction professor Emma Mercier. A flexible Bachelor of Science degree program, the learning and education studies major prepares graduates for careers as trainers or leaders in business, government, health care and other industries. The degree, rolled out this fall, is the college’s first undergraduate program developed for students who are not aspiring to become licensed teachers. The program includes a DELTA concentration, which was designed to attract undergraduate students interested in the creation of digital learning environments, the design of educational simulations or apps, and the deployment of technology across formal and informal instructional settings, Mercier said. “We’re really just beginning to see education majors for people who don’t want to teach emerge in colleges of education, so Illinois certainly is one of the few universities in the country doing this right now,” said Mercier, who taught in a similar program in the United Kingdom prior to joining the Illinois faculty in 2013. Mercier will teach several of the new courses that will be offered, along with faculty members Luc Paquette and Robb Lindgren. Among the new courses Mercier will teach in spring 2016 is Child Development and Technology, which will explore young children’s use of educational toys, games and applications and these technologies’ impact on development and learning. A new graduate seminar course, Learning and the Body, to be taught by Lindgren, will explore how body movements and physical engagement with the environment are connected to learning. Students will be exposed to new technologies that respond to gestures and other embodied actions and will design embodied learning activities around a topic of their choosing. A second new graduate seminar, taught by Paquette, will explore the emerging field of educational data mining and how to apply “big data” techniques to addressing important issues in education. A new introductory course on the intersection of learning and technology, CI210, will debut in fall 2016 and will be open to freshmen and sophomores. Although many of the DELTA courses are 400-level courses, they are open to enrollment by undergraduates as well as graduate students, Mercier said. Students in all of the programs will have opportunities to learn and conduct research in the college’s state-of-the-art Illinois Digital Ecologies and Learning Laboratory. 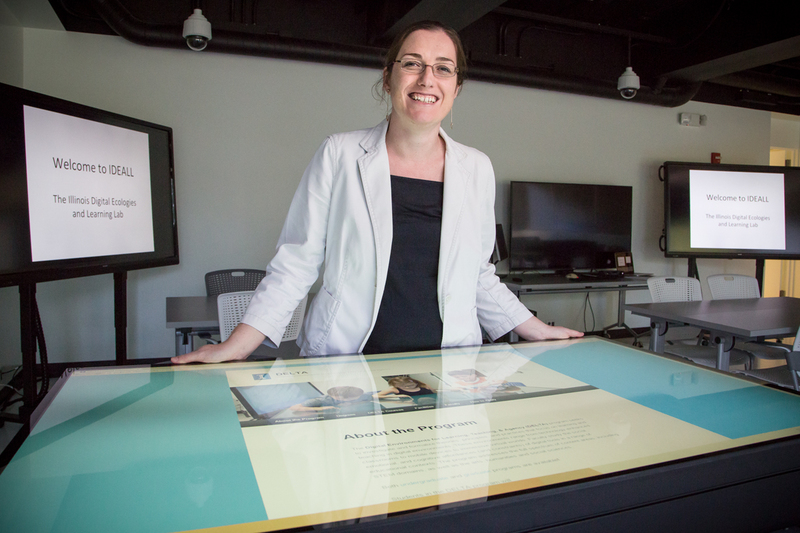 The lab, which opened this fall, is part of an effort by the college to increase technology-based learning research and provides novel tools, such as immersive environments and multitouch surface tables.